Arthritis is a painful, chronic, and sometimes debilitating condition. According to the Arthritis Foundation, it is the most common cause of disability in the U.S. There are 53 million adults and nearly 300,000 children struggling with arthritis every day. While medications and other traditional approaches can bring relief, diet and supplements can also play an important role in alleviating the symptoms and the severity of the condition for many people. If you have arthritis, learn about some of the herbs, supplements, and foods you should be eating, many of which can be added to your favorite smoothie recipes. Osteoarthritis. This is the degenerative type of arthritis that a lot of people develop as they age. It occurs when cartilage, which normally cushions joints, starts to wear away, causing bone to move against bone. This gets worse with time, but can be prevented with exercise, being a healthy weight, and avoiding injury. Inflammatory arthritis. When the immune system attacks joints and causes inflammation, it results in the symptoms of arthritis. This category includes both rheumatoid and psoriatic arthritis. Why the immune system does this is unknown and anyone can develop one of these diseases. There is no cure for these conditions, but treatments can relieve symptoms and slow the progression of the disease. Metabolic arthritis. This condition occurs when the body makes too much, or can’t excrete enough, uric acid. Uric acid forms needle-shaped crystals that cause arthritis symptoms. This is also called gout. Childhood arthritis. This is an umbrella term for various types of arthritis that affect children younger than 16. Juvenile rheumatoid arthritis is the most common type of childhood arthritis. Most kinds of arthritis can’t be cured. In some cases where a known and treatable disease is causing the symptoms, treatment may bring about a cure. For everyone else, slowing the progression of the disease and treating the symptoms are the most common ways to alleviate the pain, discomfort, and immobility caused by arthritis. Painkillers like anti-inflammatories and corticosteroids that target inflammation are most common for treating the pain of arthritis. Inflammatory arthritis can also be treated with biologics and disease-modifying antirheumatic drugs. These target different stages of the immune response to stop it from attacking the joints. Physical therapy can also help, as can lifestyle changes like losing weight and getting more exercise. In serious cases, surgery may be needed to repair or replace a joint. There are many problems with the traditional treatments for arthritis, one of which is that they simply don’t always work for everyone. Painkillers are just a Band-Aid and biologics that block the immune system leave patients open to catching contagious illnesses and not being able to fight them. While medications may be the best choice for many people with arthritis, and it is a choice only a patient with their doctor should make, alternative therapies can also help. Diet is extremely important when it comes to how someone experiences arthritis. Changing the diet can make a big difference and bring about a lot of relief from joint pain. Anything with omega-3s. 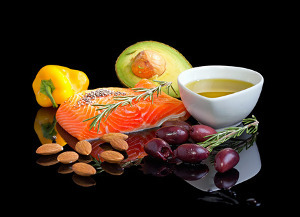 Omega-3 fatty acids reduce the presence of two key inflammatory proteins in the body: C-reactive protein (CRP) and interleukin-6. Eat fatty fish like salmon and tuna, grass-fed meats, chia or flax seeds, walnuts, and pastured-raised eggs. Bone Broth. This is perhaps the most nourishing food for your joints and bones. Bone broth is rich in glucosamine and chondroitin, important nutrients that are necessary for properly functioning joints. Fruits and vegetables. More fruits and vegetables in the diet provide antioxidants and promote a healthy immune system and healthy joints. Nuts and seeds. These are full of monounsaturated fats, which fight inflammation. Walnuts, almonds, pistachios, pumpkin seeds, and pine nuts are all good choices. Olive oil. Olive oil contains monounsaturated fats and antioxidants, but also oleocanthal, which is a compound known to reduce inflammation. Coconut oil. Coconut oil has been proven to reduce inflammation. It has even been shown in studies to inhibit arthritis in lab rats. Look for extra virgin coconut oil. Besides being tasty, onions are full of antioxidants and anti-inflammatory compounds. High-fiber foods. In addition to keeping you full, fiber also reduces CRP in the body. The effect is much more pronounced with fiber-rich foods than fiber supplements. To get fiber from food, try whole grains, berries, and beans. There is some debate over this, but these vegetables may trigger inflammation. They include eggplant, tomatoes, potatoes, and peppers. Evidence is limited, so try avoiding them for a couple weeks and see how it affects your symptoms. Processed foods. Almost all processed snacks—cookies, chips, pretzels, baked sweets, candy— are high in the kinds of fats, like trans fats, that stimulate inflammation. Avoid these at all costs. Sugar and refined carbohydrates. Processed foods are also often high in sugar, but this ingredient can sneak into all kinds of foods. Sugar triggers cytokines, which are inflammatory messengers. Avoid sugar where you can, including fruit juices. Refined carbohydrates have a similar affect, so avoid white bread, white rice, and other refined grains. Replace them with whole grains. Omega-6-rich vegetable oils. Certain vegetable oils, like safflower, corn, soy, grapeseed, and sunflower, are high in omega-6 fatty acids, which can trigger inflammation when out of balance with omega-3 fats. Avoid these oils and stick with olive or coconut oils. A healthy diet not only reduces inflammation, it promotes a healthy weight. When you weigh less, you put less stress on your joints, which means less pain. Aim to eat well to reduce inflammation, but also to stay at a healthy weight as decided upon by your doctor or nutritionist. Exercise complements this plan, but make sure your doctor approves any new activity. In addition to a healthy, anti-inflammatory diet, there are several natural treatments you can try to relieve the pain and inflammation caused by arthritis. Remember to always talk to your doctor about the herbal medicines you take. Most are safe, but some may cause you side effects or interact with a medication you’re taking. Curcumin, an active ingredient in the spice turmeric, has been shown in studies to be a potent anti-inflammatory compound. Research has proven that it can significantly relieve symptoms of rheumatoid arthritis in particular, including pain and swelling, and there are no adverse side effects. Go ahead and put this spice in every meal if you can. Also from your spice cabinet, ginger is an anti-inflammatory and works in a similar way to certain pain medications you can buy over the counter. Studies have shown that four doses of ginger extract per day worked as well to treat pain as ibuprofen. Also known as frankincense, this herb is known to reduce both pain and inflammation. It may work by blocking leukotrienes, substances in the body that attack joints. One study demonstrated that boswellia reduced the rate at which cartilage in joints deteriorates in people with arthritis. Cat’s claw. This tropical vine is indigenous to the Americas and has traditionally been used to boost the immune system. For this reason, it isn’t a good choice for rheumatoid arthritis, but for those with non-autoimmune arthritis the herb can reduce pain and swelling. Thunder god vine. This impressively-named herb comes from traditional Chinese medicine. Extracts made from the roots of this plant suppress the immune system, which makes it a possible alternative for treating rheumatoid arthritis. Only the root is edible, though. The rest of the plant is poisonous. Willow bark. Willow bark has been used to treat pain for thousands of years. It is an anti-inflammatory and is the origin of aspirin. Extracts of willow bark have been shown to be effective in treating the pain of arthritis, but you have to consult an expert to get the right dose. Too much of this herb can cause negative side effects. Green tea. Although more research is needed, studies have shown that green tea could help relieve the pain of arthritis. It is thought to reduce inflammation and there are no side effects, so drink it often or use it as your smoothie liquid. The pain of arthritis can be devastating. Whether you have mild, moderate, or severe symptoms, natural treatments can bring you relief. Always talk to your doctor before trying home remedies, but don’t be afraid to try these foods and herbs that reduce inflammation and pain. Many work well in smoothie recipes, even those you wouldn’t have thought to use. Below are links to a couple of smoothies featuring some of the herbs and spices mentioned above as well as additional information on bone broth and reducing inflammation with smoothies. Have you been affected by arthritis and found relief? Please share what’s worked for you in the comments below.